Finding a good foosball table can be tough, because there’s a lot of cheap quality tables out there that are just waiting to break down as soon as you play a single game on them. That’s why we figured we’d look at the EA Sports / ESPN foosball table and review it for you. When we first looked at this table it was called the EA Sports table, but then the exact same table was released with ESPN branding. So, we’re putting them together here. We can’t find the EA Sports table anymore, so it’s likely they just changed branding and now it’s only known as the ESPN table, but anyway, let’s carry on. Overall, this is an OK table, but since it’s fairly inexpensive, you might call it a pretty good deal. Right up front, you should know that it did NOT get included in our list of the 15 best foosball tables, and honestly we’d recommend you pick one of those before settling on this one. friends. Whether you have played it before or not, experience doesn’t matter here, the ESPN table is just fine for beginners and those who don’t need to play seriously. It’s easy to play, but also lacks features like counterweighted men that professionals and experts would be looking for. This table does offer chrome plated metal rods which is decent for such an inexpensive table. It’s no Tornado table, but I have to admit it’s got a couple of decent features at least. This is a full size table, so it’s great if you want the real deal. They make a 54″ table as well (2 inches shorter than this one), which looks way different, but the one we’re reviewing here is a great size for adults to play on. Chrome plated rods are an essential part to make your game fast and smooth. They also make the table last for a longer period of time. Many brands make the steel rods that are difficult to operate during game which makes the tournament slow as well as unstable. Kids often have this problem because they need a balanced road with a good rubber grip on the handle so that they can easily move around. That’s the reason why we have reviewed other tables as the best kids foosball table ever. Quality is one of the most important factors to look for while buying a foosball table, since it’s a fair investment and you want it to last a long time. If the table is made with a standard quality wood it can be understand as a great product. A table that has used expensive wood will also increase the durability. Sturdy Table: Like I said in above point, table should be made of high quality standard material. This is what makes a table, legs and over all structure sturdiness. This table cabinet is probably about an inch thick, and has sturdy legs, so it’s fairly good quality and you don’t have to worry about it breaking easily. I have already talked about the dimension of the table. But still you may have doubt whether the table can easily be adjusted in your room or not. If you have a room size of at least 8 by 6 feet, there won’t be any issue with keeping the table in that room. Often time’s people don’t understand how to assemble the product without any trouble. Even though there are lots of separate parts that come with the unit, you won’t find it difficult at all to put together. It might take you a few hours, so keep that in mind, but it’s not all that hard. An instruction manual is provided with the product from where you can get to know the assembly process. The unit comes with a weight of 92 pounds which is an added advantage. Suppose you want to move the table from one room to another, or shove it off to the side when you’re not using it. It will be pretty simple to do that compared to a full sized 200+ pound table. The only downside to a lighter table is that it’s obviously not quite as well made as some of the heavier, sturdier models. Either way, it’s just slightly below average weight, so it may be just what you need. Table Football has become one of the top ten indoor sport games. From its establishment in the 19 century to now – people consider it great entertainment with your friends, family, and neighbors. EA Sports / ESPN have both been in the business of making excellent quality sports items for years, and while this is not a top-level foosball table, it’s a decent, well-priced alternative. Still, we recommend checking out one of the other tables on our list here, before taking the plunge with this one. 1. Inexpensive: Every tabletop games fan wants to buy his/her own Foosball Table. Some of them can afford it easily and other takes a little more time when they have done their saving. With this unit, you don’t have to worry about that at all. 2. Not Just for Kids: Whenever you’re going to buy a Football table it’s important to know the type of table you’re buying. Most home based Football tables are designed for kids – but EA Sports Foosball Table is an absolutely fine for kids as well as teenagers and adults, since it’s full sized. 3. 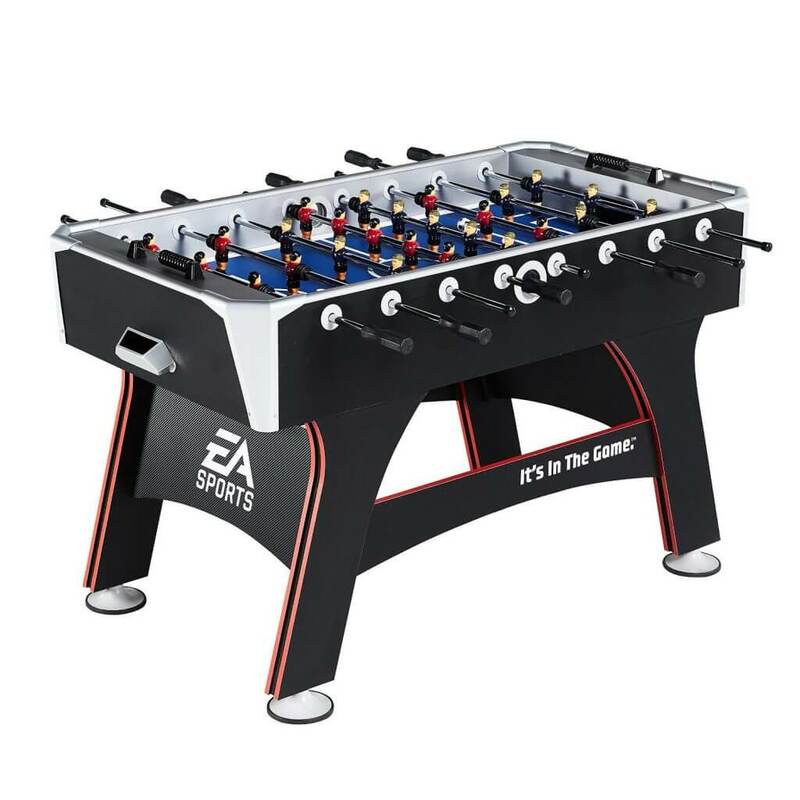 Best for both Novice and Pro level Players: Whether you’re new to the game or not – EA Sports Foosball Table works excellent for everyone: kids, teenager or college students. It means you don’t need to upgrade the table every year. ( Unless & until you’re going for a professional event or something…remember, it’s not counterweighted). 4. Two Free Balls: They give you a set of two free balls with the table, which is probably enough unless you play like a savage and smash them to death! 5. No difficulty in Covering the Table: You should protect the table from wear and tear. While it’s fairly sturdy, it’s a good idea to buy a cover for cheaper tables (they break down faster than quality table). Luckily the design isn’t bizarre enough to restrict a normal cover. Find out our choices on the best foosball table covers here. 1. Even though the assembling process is not difficult at all, you may find the whole process to be time taking. Thing is – the unit comes with tons of parts that need to be assemble together to make the table working. So you may have to spend few hours before you start playing the game. But it will not happen all the time because once you the table is ready to use it can be used as it for as long as you want. 2. There is only one color option. On the other hand, if you look at Foosball Tables like the Carrom Signature Foosball Table, it’s available in many different colors. But honestly this is trivial. 3. It’s not actually a great table. It’s OK, but it’s not great. Yes it’s fairly cheap, but we also know of a few others that are cheaper and just as good or better. Seriously, it’s a fine table at the price and you probably won’t be regretful with your decision, but why not maximize value and pick one of our other choices? 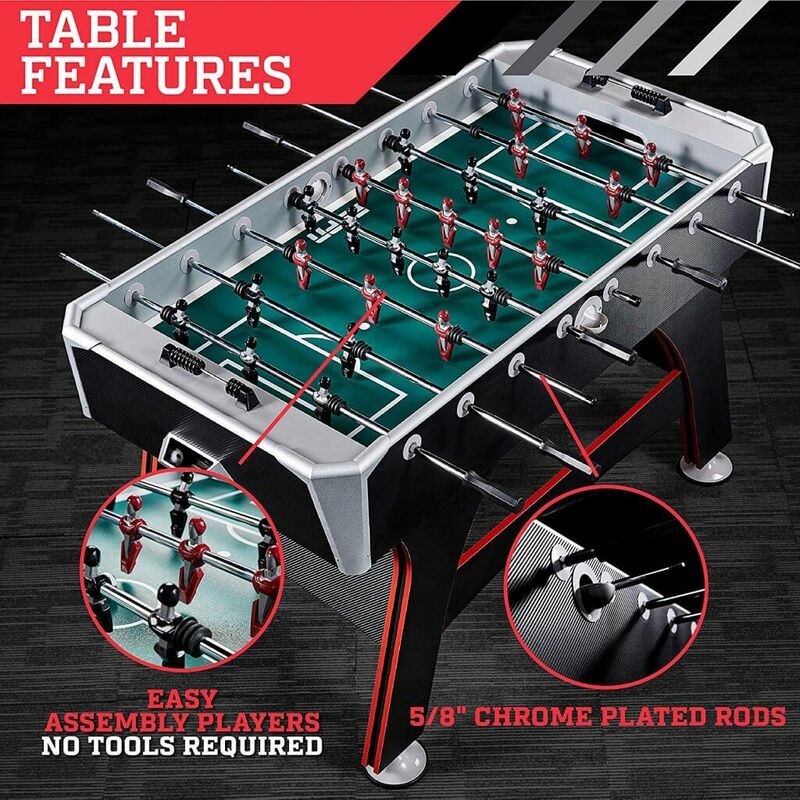 In this EA Sports / EPSN Foosball Table Review, we have covered each and every point that a first time or intermediate buyer should always know before making a purchase. However, it’s also important to know that this foosball table is obviously not designed for tournament level games. It’s best for home play by kids, teenagers, and recreational adult players. EA Sports and ESPN have been in the sports industry for many decades. They have perfected providing quality sports products to their customers, and so you should be able to trust that this is decent since it bears their logo. If you’re looking for a fairly cheap, fairly decent table, this might work for you.